Girls are busy in preparation for the annual function at the college. 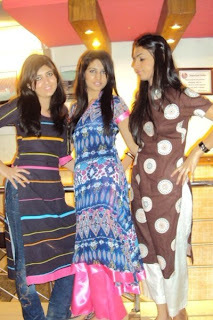 Amina, Javeria and Saima took part in the modeling segment. They told us that they are practicing hard to become the best performers of the show. These girls are happy that they got a chance to bring up their modeling talent. Beauty, style and a good figure are three traits to become a successful model, however beauty these days is not a big problem it can be obtained by good makeup. But as we see these three girls are beautiful and stylish and we wish them luck for the show and for their future.